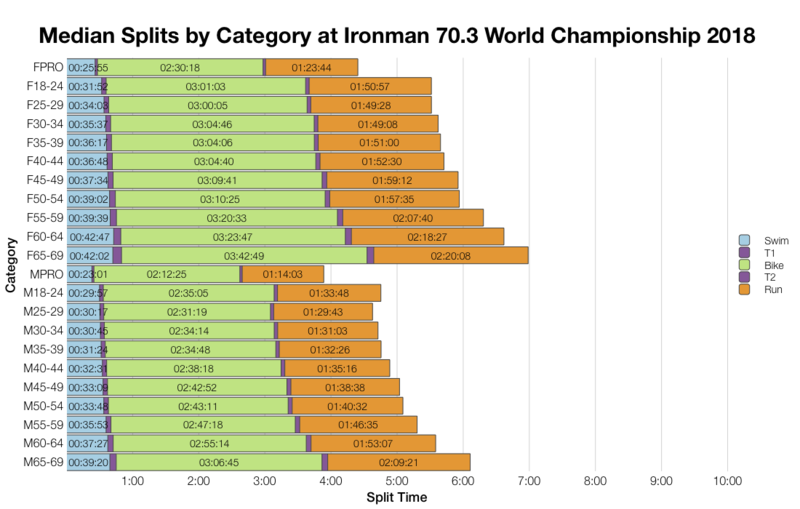 It was a big weekend of racing for 70.3 athletes with the World Champs taking place in South Africa. I don’t track 70.3 racing as I do for the full Ironman, but I will make an exception for the championship event. 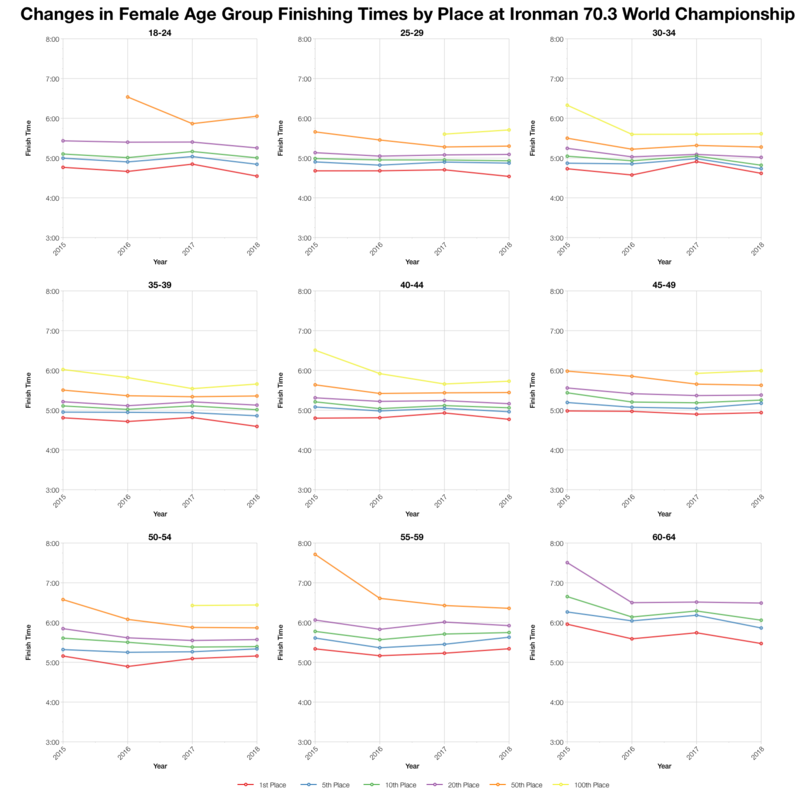 Analysis is made more complicated by the fact the race moves location (and date each year) so charts are presented for comparison, without much commentary. As entry is by qualification we should expect that times tend to be fast. 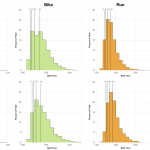 As each year of results comes from a different location I’ve chosen not to merge the historic results for any comparison of the distributions. You can pick the year you want to compare with from the selection above. 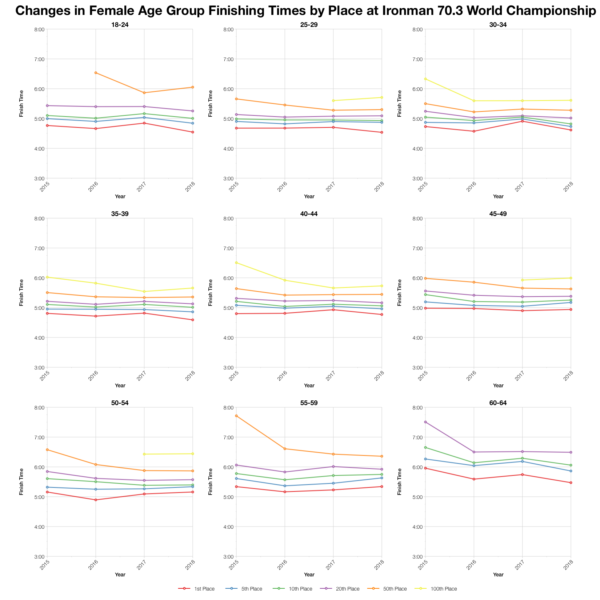 This year’s charts are very cleanly skewed towards fast times as expected at a championship. 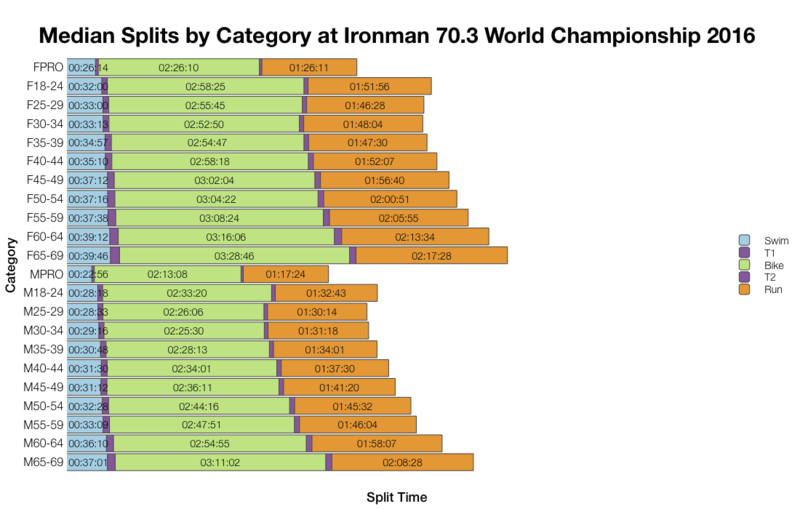 Overall entries to the 70.3 World Champs are pushing towards 4,000 athletes. The race is now split over 2 days making it easier to accommodate this numbers, but those individual days are still comparable to any mid-to-large sized race. DNF rates are low across the board. Bear in mind that the 2015 results do not cleanly separate DNS numbers from the DNF figures and are higher for it. 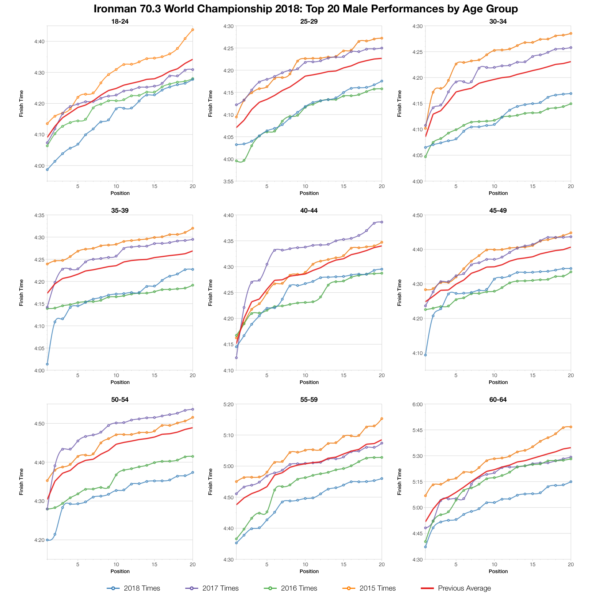 You can compare the age group medians in the above charts. 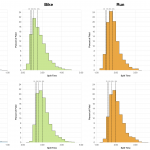 There’s some variations over the years, but generally differences are small. Moving location has a big influence on the makeup of the field. 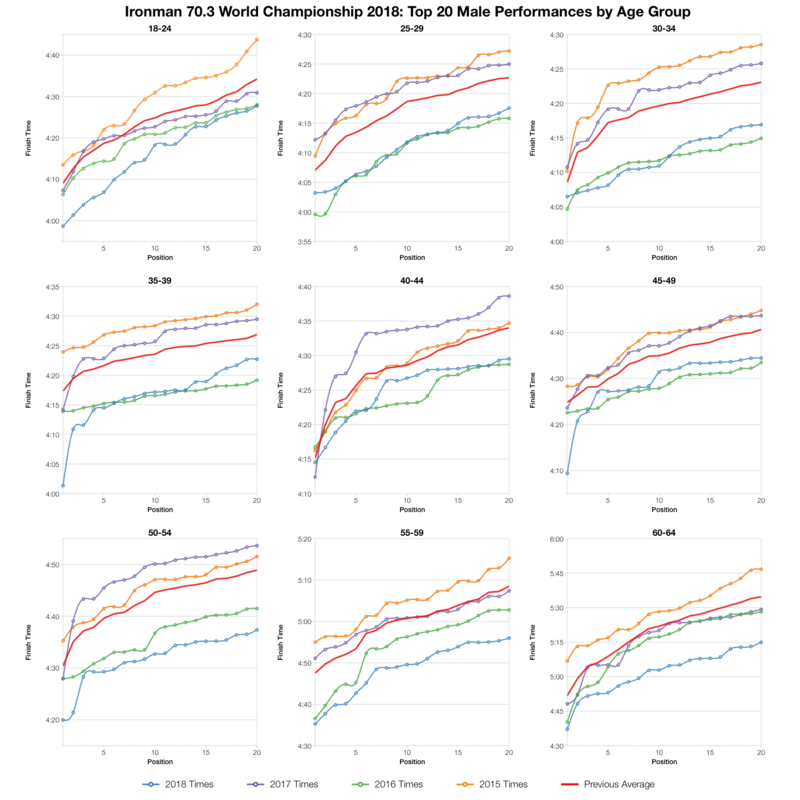 In 2017 when the race was in the US the US contingent doubles from it’s usual 20%. You can see this year drew a larger field from South Africa and there’s similar influence for the race when in Australia (2016) and Europe (2015). 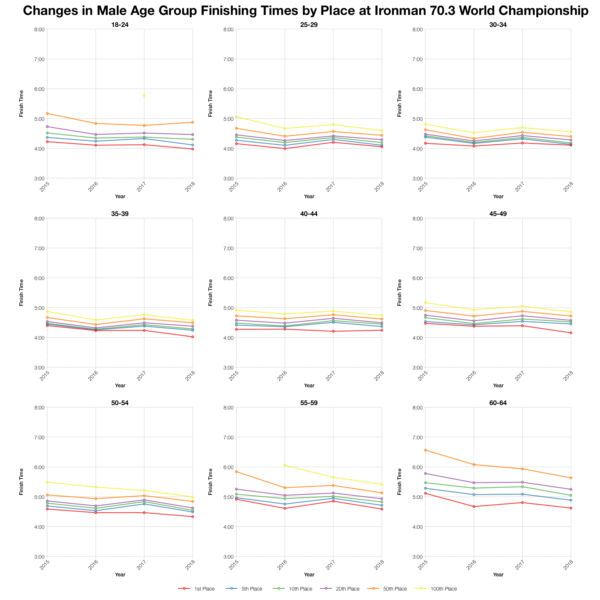 Tracking specific age group positions over the last 4 races shows that there is always variation in performances at each venue, but not huge shifts. This year looks to come in faster than the last, in some case faster than the last three. 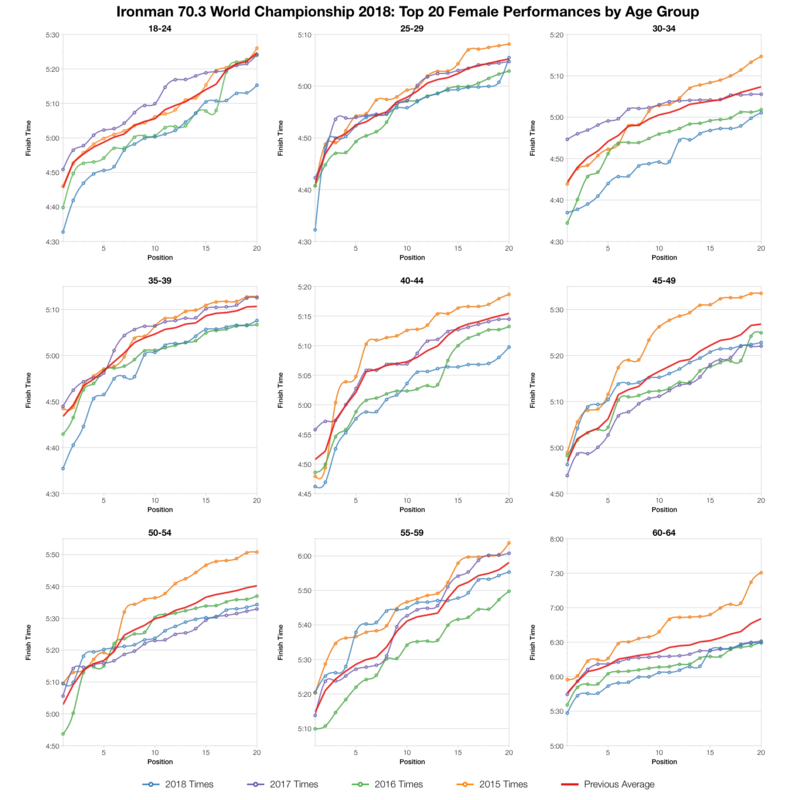 comparing the top twenty in each age group shows that this year’s World Championship was one of the fastest of the last four. 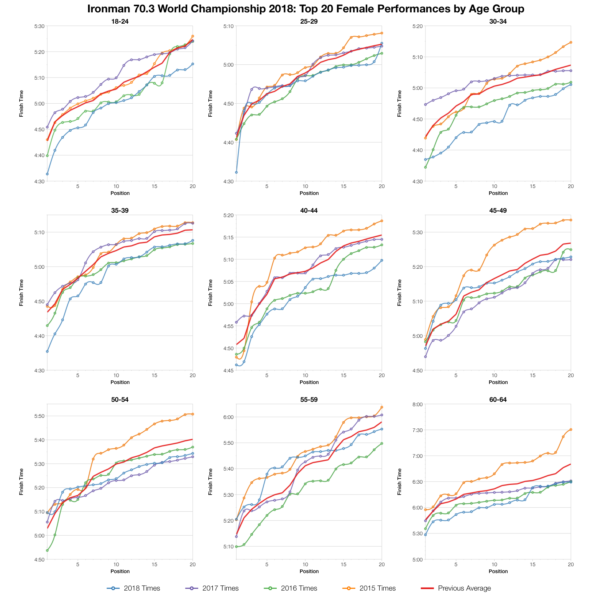 Times are generally ahead of other years, only 2016 in Australia compares. They’re certainly all ahead of the averages from the previous 3 years. The course and conditions look to have been well suited for a fast race form those that qualified. You can access spreadsheets of the men’s and women’s results from the Ironman 70.3 World Championship 2018 on my Google Drive.